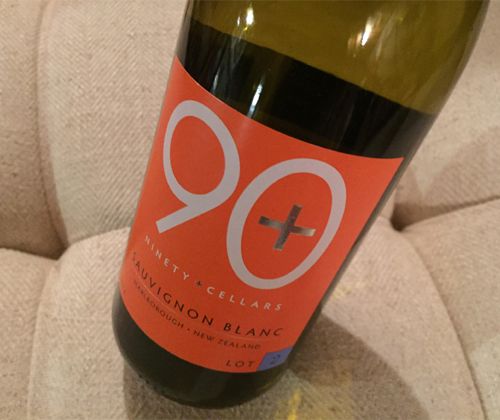 One of 90+ Cellars' top selling items is their Lot 2 Sauvignon Blanc out of Marlborough, New Zealand. There are rumors that it's a certain popular Sauvignon Blanc with a green label whom will remain unspoken, but I can tell you that it's not and I'm not sure why that rumor exists. The Lot 2 is much better than that rumored source label. Also, if you bought this wine under the source label it would cost you $16, while under 90+ Cellars it'll cost you $12. The color of the wine is pale yellow with a silvery shine. On the nose there's Tic-Tac shell, grapefruit, green pepper, lemon peel and celery. It's firmly structured within its medium body, yet still crispy with a sharp acidity. On the palate there's flavors of lime, grapefruit and pear. With the finish you're left with the saliva in your mouth stripped away as if it were a highly tannic red, and there's flavors of lime and pear. It's just so very good and so very New Zealand. In fact, it does not get much better for New Zealand Sauvignon Blanc at $12. I insist that you give it a try. Excellent, especially at the price.